The study guide is based on a chapter by chapter progression through the text. Study questions are drawn from the text, as well as from new information as to New Thought's influences provided in the guide. The Chapter Study Guide is available only in packages. Please note that the Study Guide and the Workbook (below) are copyrighted and that no part of either may be reproduced or transmitted in any form by any means without the written permission of the publisher. This means that questions from the Guide cannot be disseminated without permission. 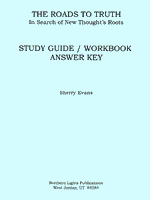 It is intended that each student should have his or her own copy of the Workbook.